In your group of friends, do you have one person who knows the lyrics to every song. He or she is the musical prodigy who can quote 80s hair bands to Justin Bieber. 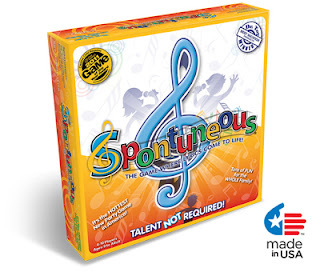 At your next neighborhood game night, make sure that he is on your team when you play Spontuneous. 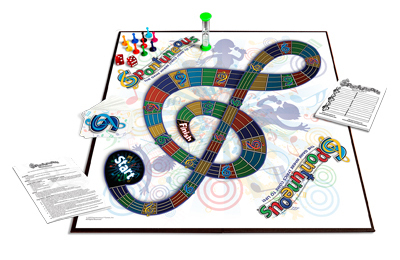 Spontuneous is the fun party game that tests your knowledge of music lyrics. What does it mean to be Spontuneous? It is acting on the natural tendency or impulse to burst into song. No, we aren't talking the stage musical moment brought into your life. We're talking about the ability to be a fast thinker combined with wealth of lyric knowledge. The fun and frivolity with your friends is a bonus. Here's the premise of the game. Players take turns trying to think of a word that will stump the other players from being able to sing a 5-word portion of lyrics (from any song) that contains the given Trigger-word. If the 15-second timer expires and you have stumped everyone, then you must prove you know a song containing your own Trigger-Word or else your penalized. It will test your knowledge of lyrics and will forever change the way you listen to music. My husband and I gathered some family members and friends to play over the holiday. I can honestly say that I haven't laughed that hard in a long time. Granted as the night progressed the words got harder (or sillier depending on your opinion). The hardest part isn't thinking of a song with a specific word or phrase; it is singing at least five words of the lyric. Think about it. I can think of a bunch of songs with kiss in the lyric but can you sing five words out of the songs? Also, can you think of the lyrics quickly? So many ideas were on the tip of my tongue or were thought of too late. A bonus to this game, you don't have to sing on key (otherwise I would be instantly disqualified). Actually, being tone deaf or without musical talent is a definite bonus to having fun. The game retails for $24.95 at the Spontuneous online store or local retailers including Marbles the Brain Store. Disclosure: I received this game to review and giveaway. All opinions are my own. I would use love as a trigger word. I'd use the word Rainbow! Together would be my trigger word. I would use the word "Party" as my trigger word! I would use the word dance! I would use "Soul" as a trigger word. My trigger word would be "love". I would use Love as my word! I would use music notes as my trigger word.